Recently, you may have noticed that your azaleas appear stripped of leaves. You get closer and, in fact, the leaves have been chewed right off. If you look carefully, you are likely to find evidence of, or catch red-handed, the azalea caterpillar (Datana major). These creatures show up on azaleas from July to October and can cause severe defoliation of all azaleas (Rhododendron spp.). Disappearing leaves are one sign; their frass (poo) is another, especially when a lot of caterpillars are present. While this caterpillar turns into a relatively small (1¾ inches), drab (light brown) moth, the caterpillar is the most noticeable, and damaging, life stage. They start off feeding in groups and are only about ½ inch long. At this point they look light brown from a distance due to their yellow body and light red stripes. Once they mature, azalea caterpillars can reach up to two inches long and have a striking appearance with black bodies, bright broken, yellow stripes, bright red head and legs, and little hairs that stick up in the air. When disturbed, they turn up their head and rear end. The small young caterpillars skeletonize the leaves while the larger caterpillars devour the whole leaf. 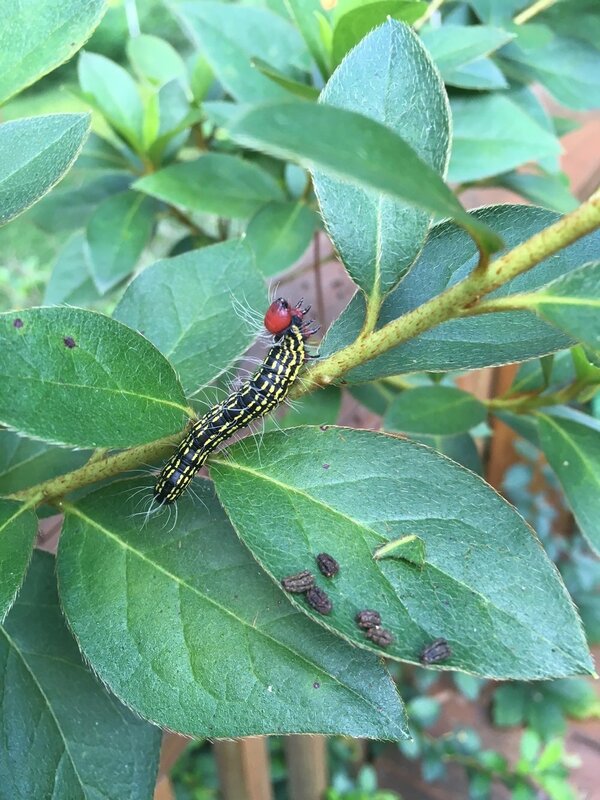 Depending on how many caterpillars are present, how healthy the plants are, and other environmental factors, damage from azalea caterpillars can get to the point where some control is necessary. The point at which control is necessary is depends on how much injury each homeowner is willing to take before attempting control measures. If you enjoy seeing wildlife in the yard, leaving more caterpillars may lead to more birds later on! If you’re trying for the best lawn in the neighborhood or have caterpillar poo piling up on your pool deck, you’re more likely to have a lower threshold. Control measures include physical removal and/or chemical control. While they look scary, you can pick them off without injury. If there are too many to pick off, the least toxic chemical control for azalea caterpillars is Bt, which works best on the smaller caterpillars. As always, read all label directions before using any pesticide. For more information on azalea caterpillars and their control, see the UF IFAS Featured Creature site. For other azalea and landscape plant concerns, contact your local county extension office.